There are a number of advantages that a cordless handheld vacuum will have over a corded one – Transportability and convenience are the two main plus points that consumers want. However, being cordless usually means less power and a battery time limit. You may also find helpful our Best Cordless Handheld Vacuum Cleaner Comparison Chart. Here are 5 of the best cordless handheld vacuums that excel in those departments. Please Read: We now have an updated version of this article at the Top 10 Best Cordless Handheld Vacuums. Please read that instead. One of the most popular cordless handheld vacuums currently is the B&D CHV1410L DustBuster (read full review here). Its Smart Technology uses up to 50 percent less energy, which is why users can get a decent run time out of this device (up to 30 minutes). It also incorporates a Lithium Ion battery which has advantages in holding a charge much better in comparison with other batteries. The innovative design is exemplified by its rotating, slim nozzle which is useful in accessing tight areas, and the built-in slide-out crevice tool and on-board brush adds even more versatility to this handheld vacuum. The B&D PHV1810 Pivot Head features a unique design where the head can pivot 180 degrees for more flexibility during cleaning and folds in half neatly for easier storage. 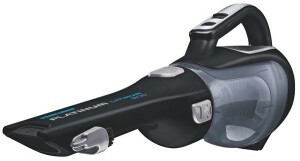 Much like in Black & Decker’s other handheld vacuums, this model also features the slide-out crevice tool at the head, and an on-board brush tool below it. Although it uses a NiCad battery, which is known to not hold its charge as well as Li-Ions, users of the B&D PHV1810 have still cited good running times of over 15 minutes. It’s also highlighted as being relatively quiet compared to other handheld vacuums with similar or more power, which makes it suitable even late at night. While some may argue at the price tag of a Dyson product, their innovation and technology is impressive to behold, and the Dyson DC35 is a prime example of that. But what makes the Dyson DC35 valued so much by its users? Its patented Root Cyclone Technology ensures that there’s no loss of suction, and no filters are necessary, saving you replacement filter costs. It has a digital motor that provides excellent power-efficiency. It has a dual power mode that enables you to either use 15 minutes of constant suction or 6 minutes of Boost Mode which has even more suction power. There are a heap of other features from the Dyson DC35, including accessories such as the aluminium wand for far-reaching tasks and the 2-type motorized brush tool for thorough cleaning. Most consumers who have shelled out their money for the Dyson DC35 are certainly happy and have reaped all the benefits from the techy handheld vacuum. 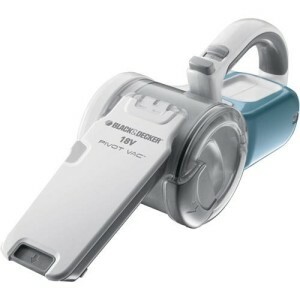 The Flex range by Black & Decker feature a slightly larger frame than more conventional handheld vacuums, but with its extra size, comes more improved performance and better features. 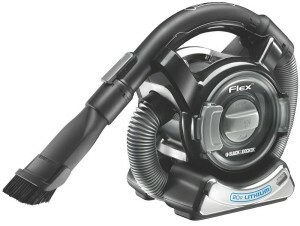 The Black & Decker Platinum BDH2000FL (read full review here) is the best in the Flex range, and let us explain why. One of the first things you’ll notice about this device is the 4’ flexible stretch hose that’s neatly wrapped around the base, used for reaching high places and tight spaces. But underneath the surface lies more important benefits. Long-Life Lithium Technology: Has ability to hold a charge for 18 months. Smart Charge Technology: Only charges when necessary meaning you don’t have to take it off charge. Filter Refresh: Improves suction power by flicking debris off the filter. 3 Stage Filtration System: Prevents dust and debris from escaping from the clean air exhaust. There’s a lot more to it than meets the eye, and other things worth pointing out are its long running time at up to 25 minutes and its host of tools that’s included with the B&D Platinum Flex. 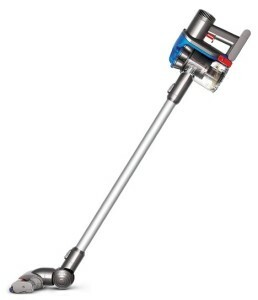 It’s safe to say that we and consumers find this among the best cordless handheld vacuums available today. 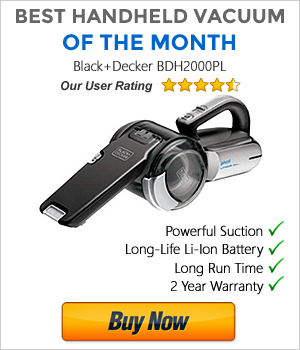 Black & Decker’s premium range of handheld vacuums are known as Platinum, and another one is the Black & Decker Platinum BDH2000L (read full review here). It’s much different in design than the above Flex Platinum, but nevertheless it has the same technology “underneath the hood”. 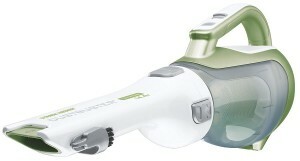 Adopting the same rotating nozzle as the popular DustBuster, with the slide-out crevice tool and on-board brush, but sporting a lot more power from its 20-volt Li-Ion battery. Users have been getting an average of an astonishing 45-60 minutes of usage from a full charge, which easily makes this one of the most energy efficient handheld vacuums around.